Do you believe in Ladies’ Luck? I did and it worked. LOL! I have frequent this shop almost monthly for a few years but never had the opportunity to meet up with the boss but it took Gill’s visit there for the first time to meet up with him. Don’t you think that’s luck? Haha! Anyway, this stall has been there for about a decade, serving and supplying to those community from the different jetties surrounding there and many more. Little known to the outside communities, they are the wholesale supplier of yummy fritters for many food stalls, retailers, weddings, birthdays and parties. 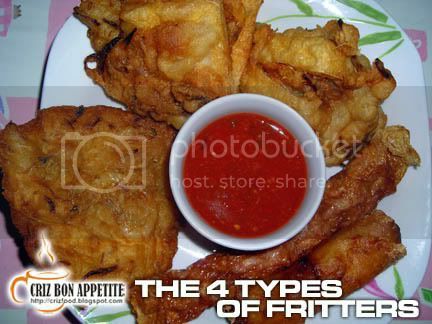 They have four types of fritters sold, mainly prawn fritters (Hae Chee) – 90sens, bean curd prawn fritter (Tau Kua Chee) – 90sens, mini spring rolls (Poh Piah Chee) – 80sens and pork rolls (Loh Bak) – RM1.60. If you are observant enough, you would also see some packets of yellow noodles by the side. This is another way of taking the prawn fritters accompanied by the raw noodles. I have not tried that before as I prefer to take my noodles well cooked minus the taste of the lye water.Some might consider the price of the Loh Bak selling at RM1.30 a piece to be expensive. To me, it’s still reasonable as the pork roll is longer than the norms. There is also another thing that you have to take note of. If you are having takeaways, make sure that you consume soon as the fritters may lose their crunchiness. If you intend to get them for later consumption, either you order and collect them nearer to your party time or you can ask them to semi-fry your orders so that you could refry them when you need them later. For those people not staying near Weld Quay area, you might get lost trying to locate this shop as it is hidden from the view of the main road. 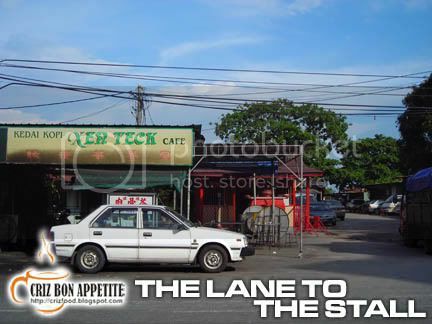 If you are coming from The Pengkalan Weld Shell Petrol Kiosk, just drive forward until you have reached a coffee shop by the name of Xen Teck Café with a little shrine next to it o your left. Drive into the lane and you can see the shed where it housed this stall. 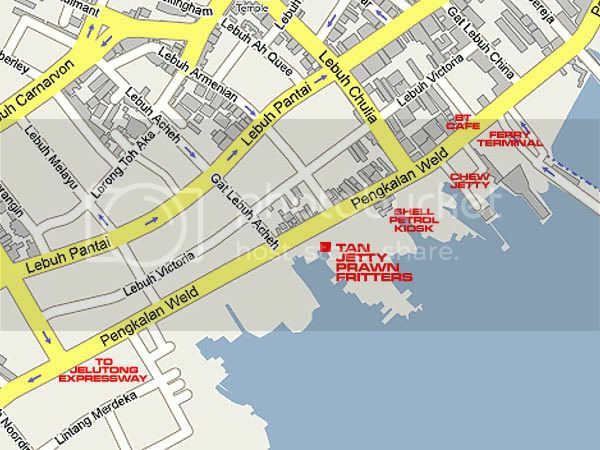 Address: 90-A, Tan Jetty, Weld Quay, 10300 Penang, Malaysia. WHERE IN THE WORLD IS LANG SAE LEE? My friend who is from the Weld Quay area told me that they take the prawn fritters with yellow noodle circled around it. She said it’s yummy wo…but so far I have not tried before. I love the Hae Chee and Poh Piah Chee. But I need to control for not taking too much fried food. Aiyo…. I clicked too fast and posted the comment. Lazy to delete. Haha. looks good leh. 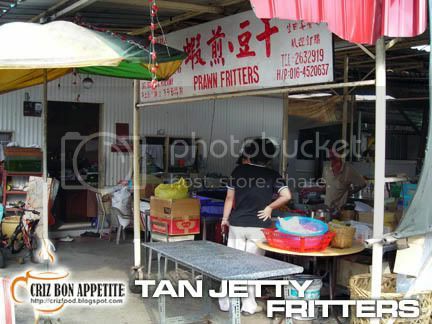 I heard near the Jetties there got 1 stall of antie that sell kuih is very nice too and that stall has came up on Ah Xian Food Program. Btw, the recomendation from you just so so only. I will place this 2nd priority to be visit. 🙂 You free this weekend? wanna go dinner for veggie jiu hu eng cai? Hmmm…I’ve never tried anything from Weld Quay area before…despite the numerous rounds I’ve passed the same place…and I do notice lots of stalls there! Wooo…a lot of prawn fritters…Chinese…even got Indian fritters or Vadai look-alike? have never explore up to that area. Actually, the preference of food by individauls are very subjective. Sometimes it depends on our childhood memories. 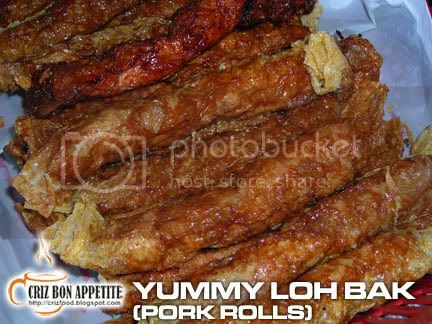 Anyway, the Loh Bak is near to the Ngoh Heang type, sweet, heavy on five spice and moist. If to compare to Kheng Pin’s Loh Bak, it is a total different type. The Kheng Ping Loh Bak standard has drop and prices has went up. It is not as fragrant, tender and crisy as before. The prawn fritters were nice. It taste similar like those sold by a stall at the small lane opposite Trader Hotel, next to Kimovik. I like to have my fritters dunk into their ‘Thor Thao Theng'(Sweet Peanut Suop). Something diffrent! The prawn fritters are also different from Kheng Pin’s.